This image shows one of the pledge cards signed by a kindergarten student. Faith Ringgold Elementary School in Hayward, Calif.
A California school system refuses to say what action, if any, it will take after it received complaints about a kindergarten teacher who encouraged her students to sign "pledge cards" in support of gays. 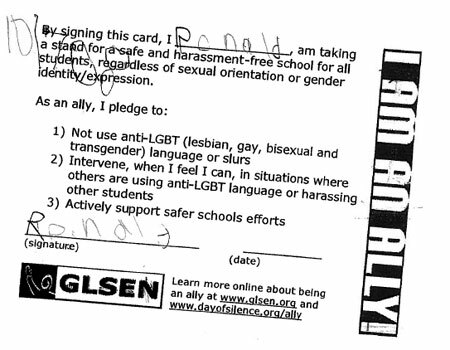 The cards asked signers to be "an ally" and to pledge to "not use anti-LGBT (lesbian, gay, bisexual and transgender) language or slurs; intervene, when I feel I can, in situations where others are using anti-LGBT language or harassing other students and actively support safer schools efforts." Parent Adela Voelker, who declined to be interviewed in depth for this report, said she was furious when she found her child's signature on one of the cards. She said she contacted a non-profit legal defense organization specializing in parents' rights. Meanwhile, a school board member, Jeff Cook, says some type of action should be taken. "We have a general rule that all instruction should be age appropriate, and this clearly was not," said Cook, who has served on the school board for five years. Val Joyner, a school district spokeswoman, told FOXNews.com in an e-mail that when deciding what to teach on this subject matter, educators "gather materials from community agencies and other education groups" and that "the materials have grade level indicators which help determine what is age-appropriate." The district said the pledge cards were intended for middle school and high school students. Asked last week if the district planned to take action against Miller, Joyner said she would have to look into the incident. On Thursday she told FOXNews.com that she did not have an answer for the question and that she would no longer be doing any media interviews. Joyner said in an e-mail that Miller, the teacher, "planned to teach students how to become an ally and conflict-mediation through various activities." She added that the district doesn't advocate for a specific cause and/or lifestyle, and it has "no curriculum for gay, lesbian and transgender lifestyles." The district employs a "Professional Learning Specialist: Equity," who is in charge of gathering material and helping teachers decide what should be taught on the subject matter. Brad Dacus, president of Pacific Justice Institute, the group representing Voelker, said parents at the Faith Ringgold School weren't notified of what was going to take place in the classroom. He said that teaching students as young as pre-school about gay, lesbian and transgender issues is common in California, but that there are "all kinds of material the average parent could find highly objectionable or potentially harmful" to their children. When asked if the school district did anything wrong, he said, "possibly," but he declined to go into detail or say whether Voelker would sue the district. Dacus would not comment specifically on whether children who signed the pledge could be held responsible if the school determined that they were not honoring it. He said they are minors and there are certain degrees of limited liability, but from a psychological and emotional perspective, it's a whole different ballgame. "[There is] tremendous peer pressure put on children to accept a pro-homosexual philosophy and attitude," Dacus said. Meanwhile, opponents of gay marriage are up in arms over the incident, which occurred as California voters prepare to vote Tuesday on Proposition 8, which would overturn the state Supreme Court's ruling legalizing gay marriage. 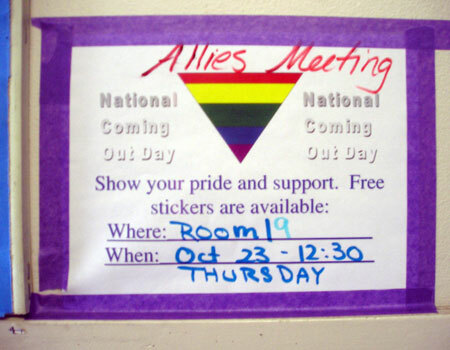 "How do you teach a 5-year-old to sign a pledge card for lesbian, gay and transgender issues without explaining what transgender and bisexual is?" asked Sonja Eddings Brown, a spokeswoman for Protect Marriage California.